Who Knew Michael Shawn Could Dance? 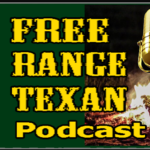 Episode 15 of our Free Range Texan Podcast openly admits the existence of a canine super hero heretofore left in the background of our production. Apparently there is no longer any keeping of “Foxy the Wonder Dog” a secret. Big thanks to Daniel Jones for bringing us up to date. We freely admit that technical problems occurred with Daniel’s interview and there are parts of the podcast on that account that require you to listen harder because Daniel was on the road and away from any of our digital recording devices. Honestly, folks we will take steps to improve all of that in the future. We left Michael Shawn alone to create his campfire segment, and when that happens you can count on the fact that his heart for Texas generally takes over the conversation. Thank you Michael …. good info. Oh, yes, and the last thing we want to mention is that this is the first of our podcasts that our host actually opened and closed the show break dancing for our audience … Is there no end to Michael Shawn’s talent? If you haven’t heard Episode 15, we suggest you climb aboard.